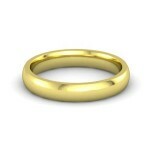 The days that all married men wore yellow gold wedding bands are long gone. Gold is still an option but white is currently in favor over yellow and a range of metals are available as well, at higher and lower costs. If you’re concerned about whether a ring can be cut off in case of an emergency, all of these choices are safe to wear. According to Snopes, the titanium bands that started this scare can be removed with a bolt cutter or jeweler’s saw. Size and weight: While larger rings suit masculine hands, consider how it feels on your finger if you’re not used to wearing rings. Titanium rings are extremely lightweight as are those made of palladium. If you like a heavy feel, opt for platinum or tungsten carbide. Shape: There are many styles of rings available, even within the plain bands. Edges can be domed, straight, or beveled. Curved rings are more traditional while angles and straight cuts have a more modern feel to them. If you want to incorporate gemstones, rings can be uniform all around or designed to sit one orientation. Finish: All metals tend to be shiny but are available in brushed or matte finishes as well. Soft metals like gold and platinum will slightly dull with wear but can be maintained. Palladium, titanium, tungsten carbide, and stainless steel are all scratch-resistant and remain shiny over time. Wear: Metals vary in how soft or hard they are. Softer metals like gold and platinum will show some wear and tear over time with tiny scratches and abrasions while harder metals like titanium are impervious to wear. This worn look isn’t necessarily a bad thing and is evidence of the value of the precious metal. Ask a jeweler to show you some previously worn rings to see what your ring could look like in the future. 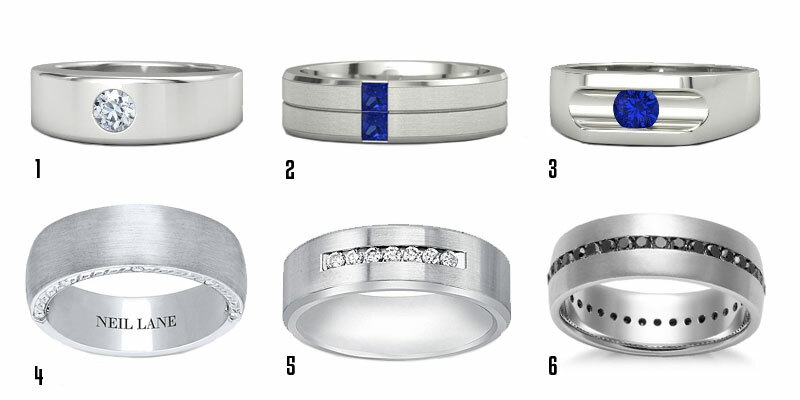 Where to purchase your wedding band: Is it crazy to buy a wedding ring online sight unseen? Absolutely not. 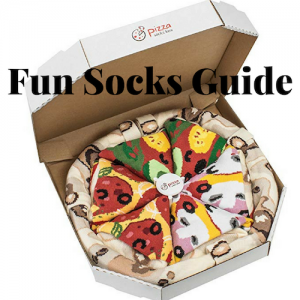 There is nothing that cannot be bought on Amazon these days and there are incredible deals to be had. 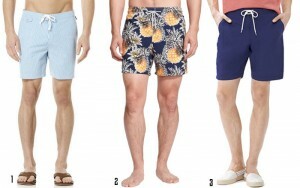 You’ll have to know your ring size and make sure there is a good return policy. That being said, there’s no substitute for shopping in store. In the photos below, many of the metals look similar in a way they don’t in person. Each metal also has a different weight and sheen so do your research before seeking out online deals. 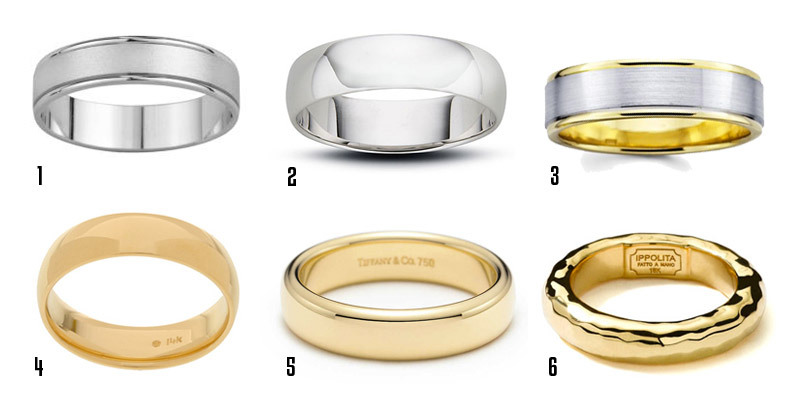 Gold remains the most popular choice for men’s wedding bands. The price of gold is currently trending downward, currently at almost half the price of the 2011 peak. This material probably has the widest range of options and designs, including the choice of yellow, rose, or white gold. The next step up from gold is platinum, another white metal. Platinum wedding bands look very similar to white gold but are more expensive, solid, and heavy. Platinum is common in watches because it doesn’t tarnish or wear out like gold can and brings the same qualities to a wedding ring. From the same family of precious metals as platinum, palladium is also low density and lower in weight. The naturally white metal is used to make white gold or be worn on it’s own. It stays brilliant over time and like gold, does not cause allergies. A relatively new type of metal, tungsten has rapidly become popular for men’s wedding bands due its durability, scratch-resistance, and low cost. The steel grey color is similar to that of white gold and titanium with a permanent polish that keeps the metal looking new and shiny. Tungsten carbide is dense and heavy and the rings have a pleasant weighty feel. Tungsten also comes in black. Black tungsten is plated with titanium zirconium alloy. The durable coating is no match for the strength or scratch-resistance of tungsten so over time scratches and chips will reveal the grey metal below. 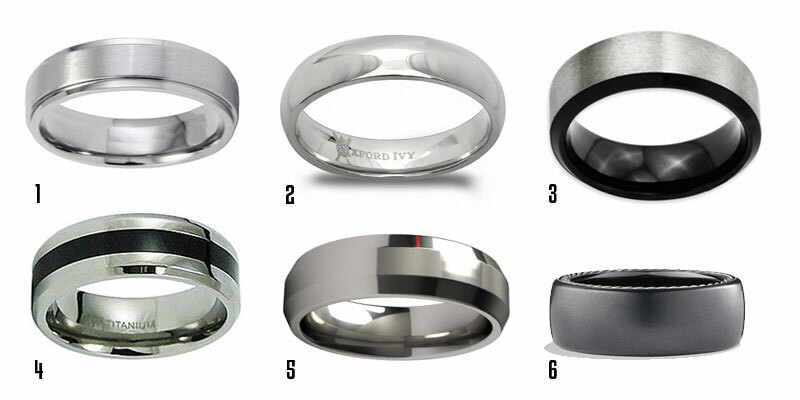 However, black tungsten rings without gemstones or inlays can be re-plated. 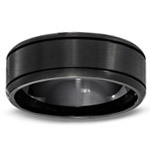 For a dark ring that won’t get damaged, check out black ceramic or black titanium. 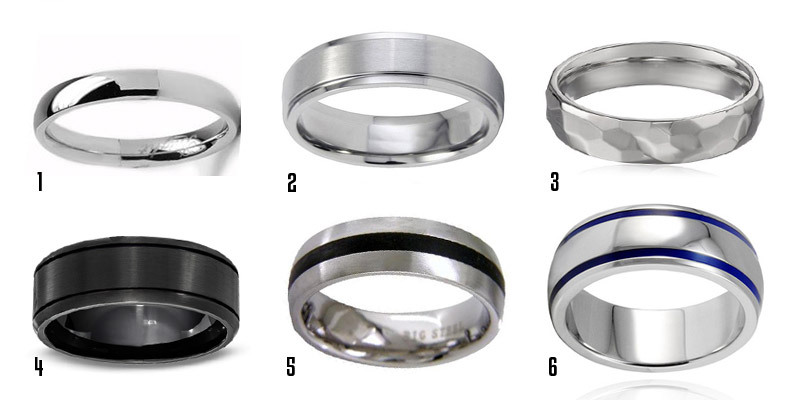 Titanium bands are popular with men due to their durability, range of colors from silver to white, and lower cost. This is the strongest metal available as well as being ultra lightweight and scratch-resistant. Titanium bands cannot be resized but they can be cut off in case of an emergency. 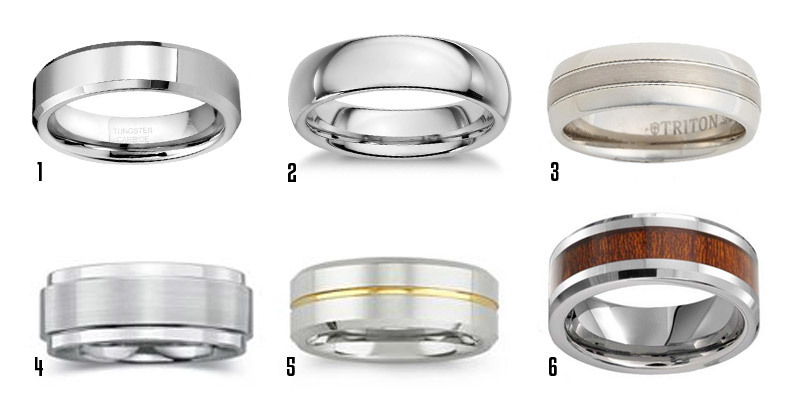 For men that like an industrial look, stainless steel wedding bands are an option. The alloy is durable and just about indestructable. Stainless steel is also available in several finishes, black, and with a range of colors and patterns, including camo. While durable and bright, stainless steel can rust and may require some maintenance. Although silver wedding bands are available out there, this metal is not recommended for daily wear. Silver is much softer than gold, so it scratches, dents, and bends easily. Silver will lose its shine, can tarnish, and even turn your finger green. 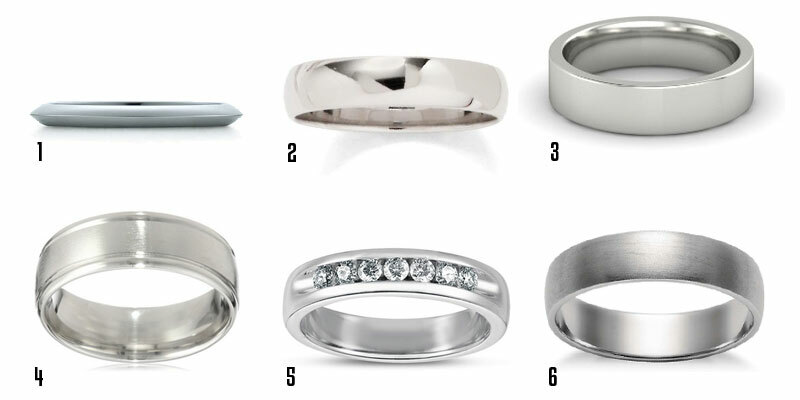 If budget is your concern, stainless steel, tungsten, and titanium rings are all available for well under $100. This isn’t ceramic like china but the result of new technologies and alternative materials like zirconium and yittra combined with specialized bonding agents. The resulting Hi-Tech Ceramic is also used in space shuttle tiles, jet engine turbine blades, and ballistic protection in addition to jewelry. The lightweight and long-lasting material will never scratch, discolor, fade, or break. It is also hypoallergenic, comes in a range of colors, and stays polished forever. We’re looking forward to seeing what Kanye West’s wedding band looks like but are pretty sure that there will be gemstones. They add color, texture, and value to a plain wedding band. This is also a way to customize a ring to suit your taste. Choose a style, metal, and stone. Diamonds and sapphires are traditional wedding stones but it’s up to you. White Pocket Squares: Cotton, Linen or Silk?